Epiphone Blackstone Model Arch Top Acoustic Guitar (1945), made in New York City, serial # 52812, sunburst top, dark back and sides finish, maple back and sides, spruce top; mahogany neck with rosewood fingerboard, black hard shell case. Overall length is 41 1/4 in. (104.8 cm. ), 16 3/8 in. (41.6 cm.) wide at lower bout, and 3 5/16 in. (8.4 cm.) in depth, measured at side of rim. Scale length is 25 1/2 in. (648 mm.). Width of nut is 1 3/4 in. (44 mm.). Excellent playing condition with some visible repair to the top center seam. Otherwise, this one remains quite clean overall for a guitar of this period. There are some small nicks, dings, and scuffs in various places but no major finish wear, and the patina of the original lacquer is still shiny. The neck was just reset with an excellent angle, so this one is ready for the next 50 years or so. 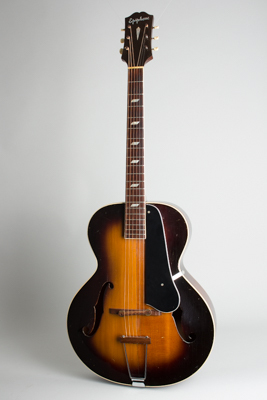 The guitar retains all its original Wartime hardware (flat-plate Kluson tuners, carved rosewood bridge, tailpiece with a wooden crossbar) except for an inexact but functional repro pickguard and bracket. An excellent player with the very LOUD, chunky, but incisive sound these old Epiphones are renowned for. Includes a modern HSC. Excellent - Condition.